Weisberg Stables is an NPIP certified facility. 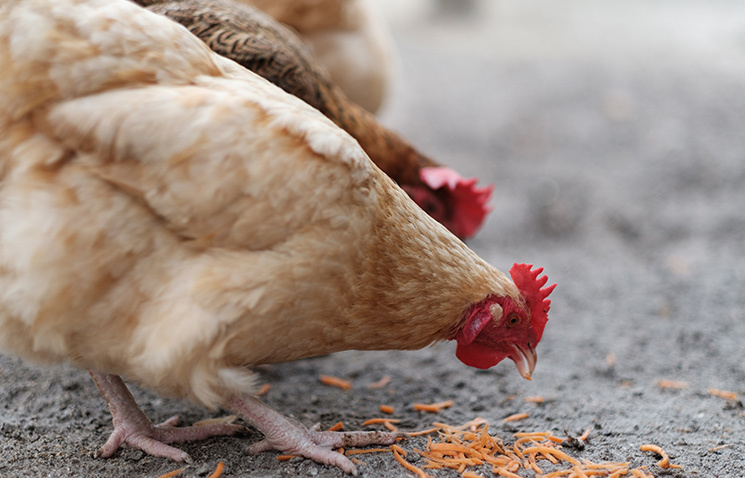 The National Poultry Improvement Plan (NPIP) is a national program in collaboration with state and federal departments of agriculture and industry representatives. The main objective of this program is to use new diagnostic technology to effectively improve poultry and poultry products throughout the United States. 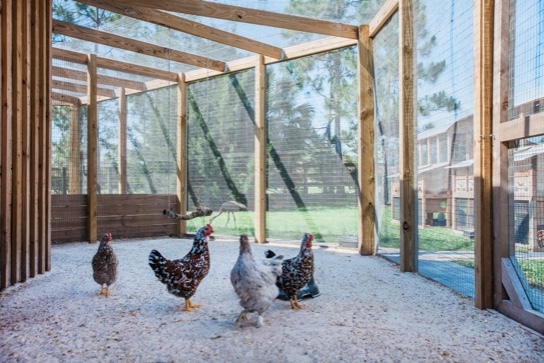 Our flocks are Pullorum-Typhoid (P/T) and H5/H7 Avian Influenza clean and are tested every 6 months by the Florida Department of Agriculture and Consumer Services. 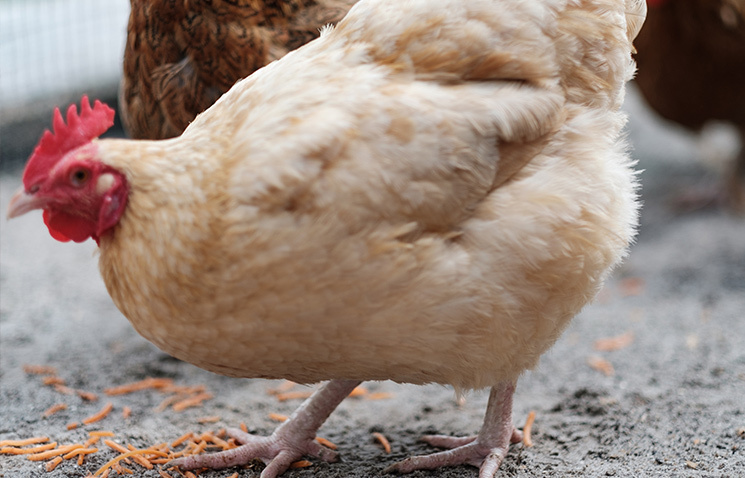 As any chicken enthusiast can tell you, chickens are like potato chips—it’s hard to have just one! Although we have X varieties of chickens on our farm, we are currently only breeding and selling 7 varieties of Heritage and Novelty chickens. 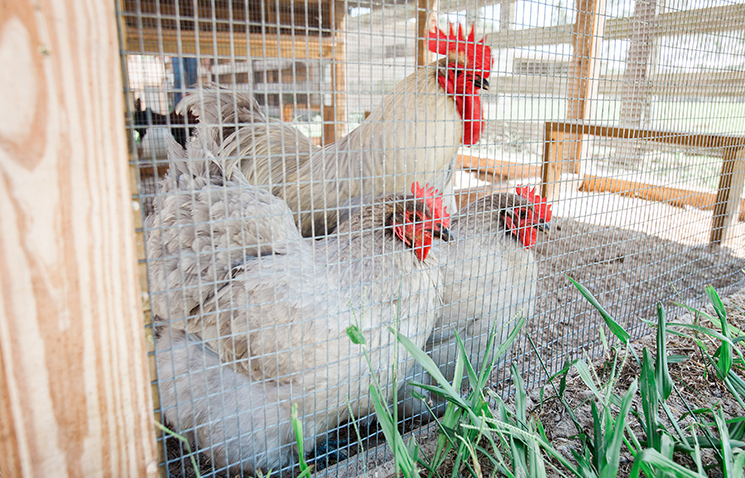 View details about each of our chicken varieties below. We occasionally offer breeding pairs for sale, so check back often. Please contact us for current availability. 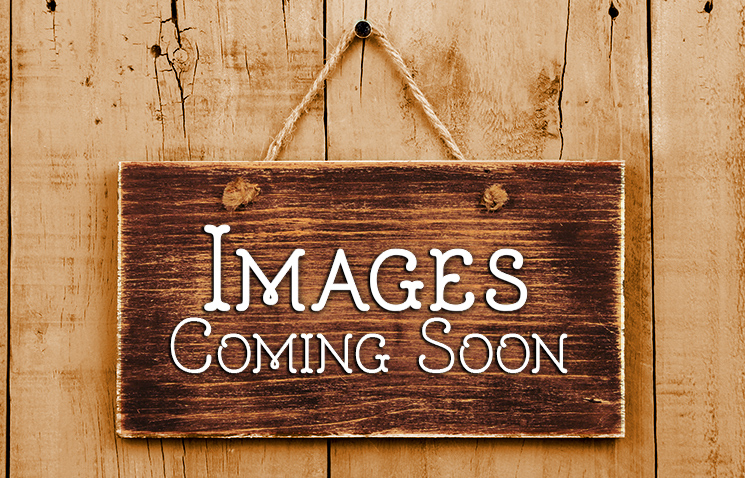 We generally sell straight run chicks and occasionally offer breeding pairs or starter flocks for sale. Buff Orpingtons are considered a heritage breed chicken and were one of the most popular dual purpose American farm chickens during the late 1800’s and early 1900’s. Known for their excellent winter egg production Orpingtons lay 200-280 light to dark brown eggs per year. Orpingtons are known for their calm, friendly and docile personalities. Roosters weigh 10 lbs and hens weigh 8 lbs. Lavender Orpington Chickens are beautiful and popular among Orpington chicken owners even though they are not (yet) recognized by the American Poultry Standard. Lavender, also known as “self-blue” are not like your typical blue chickens. Lavender Orpingtons will breed true and all of the offspring will be the Lavender color. Orpingtons are large and fluffy clean legged chickens. Lavendar Orpingtons are docile and great with children, making them one of the best options for your backyard family flock. They lay 175-200 lightly tinted, almost pink eggs per year. The Chinese Shanghai fowl came to England and America in 1845. The name of this Asiatic breed was later changed to Cochin. Cochin chickens are known as ornamental or production chickens who were admitted into the Standard of Perfection in 1874. 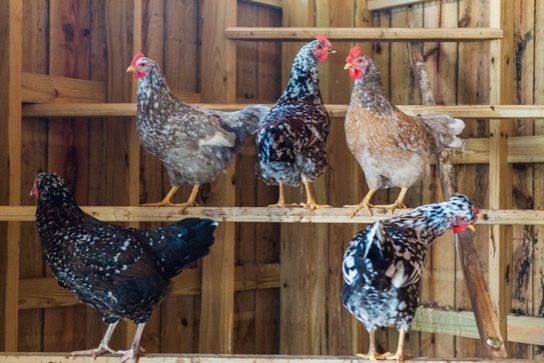 Weisberg Stables offers Cochins in Buff, White, Black, Blue, Barred and Partridge which are colors recognized by the American Poultry Association. Cochins are considered an excellent chicken for children because of their appealing size and gentle dispositions. Cochin Roosters are known to be extremely docile and are seldom aggressive. 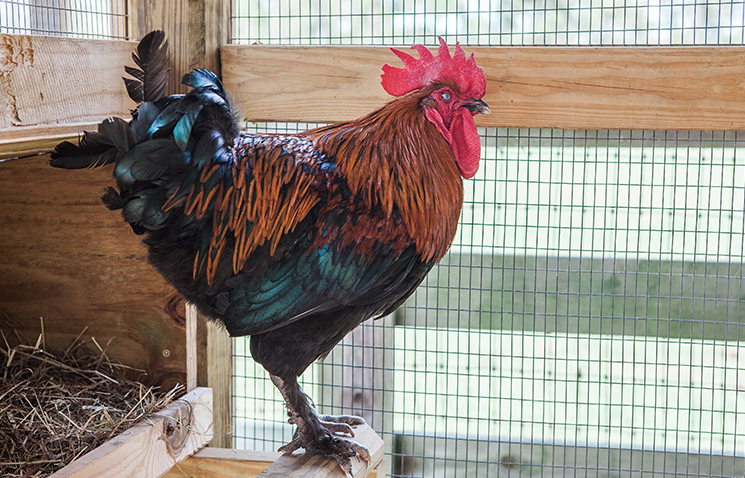 Roosters generally weigh 11 lbs and Hens 8 ½ pounds. Cochins lay 150-160 large brown eggs per year. Mille Fleur means “a thousand flowers” and it is given to these beautiful bantam chickens because of their feather pattern. Mille Fleur D’Uccles are true bantam chickens, meaning they are not bred down from larger size chickens. These chickens have heavily feathered legs. 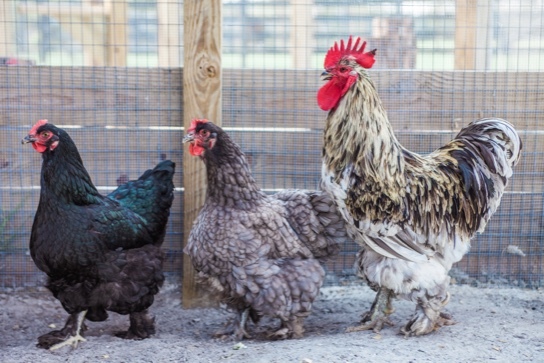 When full grown, hens weigh only 22 ounces and roosters weigh 26 ounces. Much of that weight is due to their heavy feathering. Personalities can differ greatly with breeding. 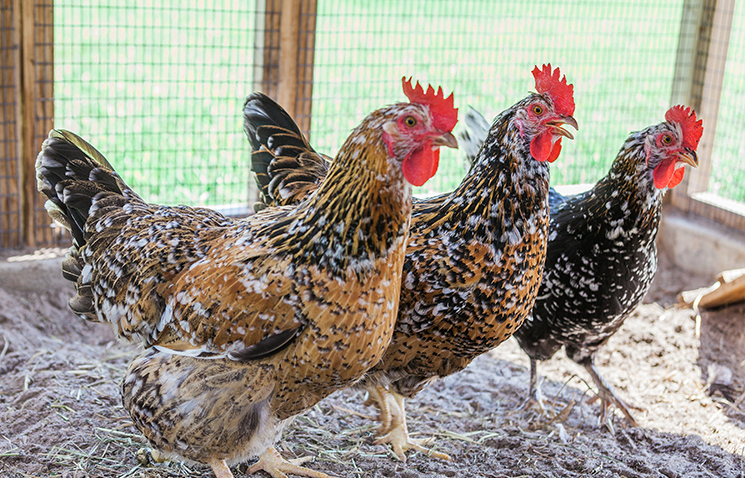 In our experience the hens have wonderful friendly dispositions and the roosters can often challenge, however due to their small size are not generally harmful or intimidating. Millies lay tiny cream colored eggs. Marans were approved and accepted into the American Poultry Association in the Continental Class in April 2011. Marans can have clean or feathered legs. Weisberg Stables breeds to the American standard of clean legs. Maran eggs are large and meet the USDA standard of extra large eggs. The Black Copper Marans are believed to have the darkest colored eggs. Egg color in Marans can be tricky and does vary by individual bird, by the time of the year, and be affected by their diet and management. Each hen lays approximately 150-200 eggs per year. Named for its colorful, spotted plumage, Skånsk blommehöna literally translates to “bloom hen.” Swedish flower hens emerged as a landrace several hundred years ago, the product of a mix of primitive breeds that were brought to Sweden by settlers and conquerors. Landrace refers to a local variety of domesticated animal or plant species, which developed over time, by adaptation to the natural environment in which it lives. As a landrace, this breed was not intentionally created by following a structured breeding program; Rather, this breed was created through natural selection and random pairings as the breed adapted to the climate and conditions. Opinions differ on how much selection should be applied when raising a landrace breed. Our breeding program involves only culling what is considered faults and adding in as many different lines as possible. Swedish Flower hens are prolific layers for most of the year. Although they are most known for their extra-large size eggs, the first ‘pullet eggs’ produced can be rather small. The Silkie chicken is an ornamental chicken that was bred in Asia. It was valued as a medicinal food item because of its black skin and bones, which was believed to be particularly good to reinforce body immunity and protect from emaciation and feebleness. The Silkies have had an interesting storyline throughout history. The first western recording of a Silkie sighting was by Marco Polo, in 1298. On his travels through China Marco Polo recalled seeing a bird with black skin and “hair like a cat.” It’s thought that he took some Silkies with him, and was the first person to introduce them to the western world. Early records show that in the Netherlands, the breed was sold as a cross between a chicken and a rabbit. In the early 1900’s Silkies were also exploited in travelling circuses and side-shows as chickens with fur instead of feathers. Despite their colorful start, the breed was officially recognized in North America by acceptance into the prestigious Standard of Perfection in 1874, the very first year of publication. 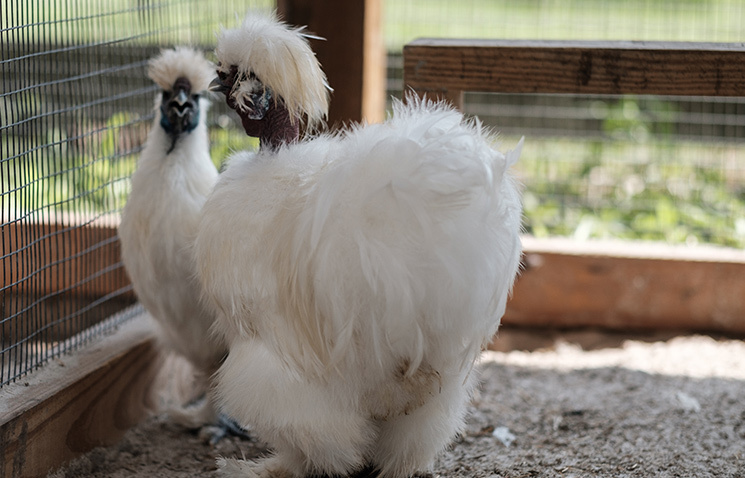 Silkies are generally known for their kind and docile personality. They are so docile that in mixed flocks they are generally bullied. Silkies make wonderful mothers and love raising a clutch of eggs so much that they aren’t picky about whose eggs they are. Silkies have feathered feet, 5 toes and dark skin. Their earlobes should be a beautiful turquoise blue. Silkies have a walnut comb. Their wattles and comb should be a dark mulberry or black (red means it is not pure bred). A standard Silkie will weigh 3-4 lbs. 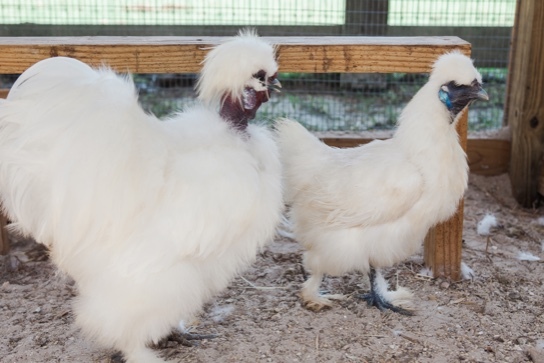 In America, Silkies are classified as bantam chickens and can weigh as little as 18 ounces. Hens lay approximately 100 tiny creamy tan colored eggs per year. Silkies are available in variety of colors. 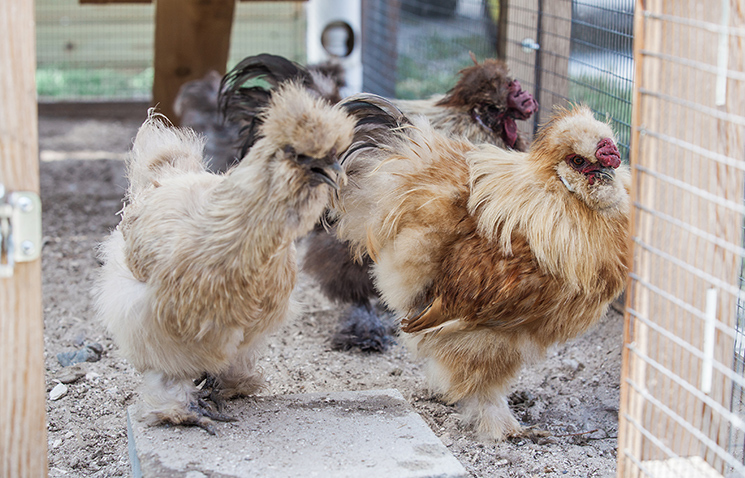 We raise Silkies in Buff, Black, Blue, Splash and Paint. 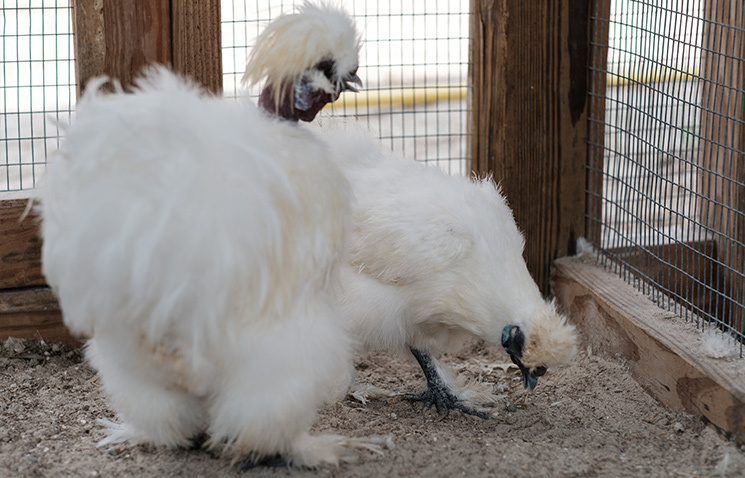 Showgirls are a mixed breed between a Silkie and a Naked Neck Turken. They are an ornamental bantam chicken and are a popular novelty chicken. Show Girls should have 5 toes on each foot, feathered legs and feet and should be dark skinned. Some Showgirls have what is called a ‘bow tie’. That’s the fluffy part on the front of the neck. Some do not have this. Some are bearded and some are not. Due to their ornamental head and limited vision Show Girls are best kept in enclosed runs rather than free ranging. Our Showgirl Chickens are very friendly and we think they are absolutely gorgeous. We believe every chicken keeper should have at least two as a friendly pet.